Adi Itscovich, one of the two new Chaverim M’Israel/Friends from Israel, with Adam Kling, part of her host family. Adi Itscovich and Asaf Munk (middle two) are the newest Chaverim M’Israel/Friends from Israel, young emissaries from Cincinnati’s partnership city of Netanya who teach Americans about life in Israel. They are pictured here with some of their host family, Adam and Shayna Kling. Each September the Jewish Federation of Cincinnati welcomes two new Friends from Israel/Chaverim M’Israel. 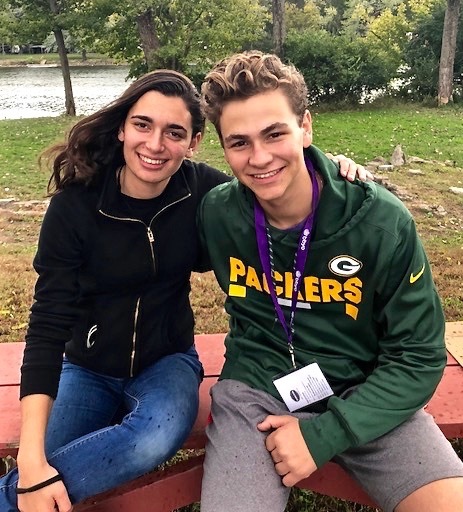 This year we welcomed Adi Itscovich and Asaf Munk, who will stay through summer 2019. 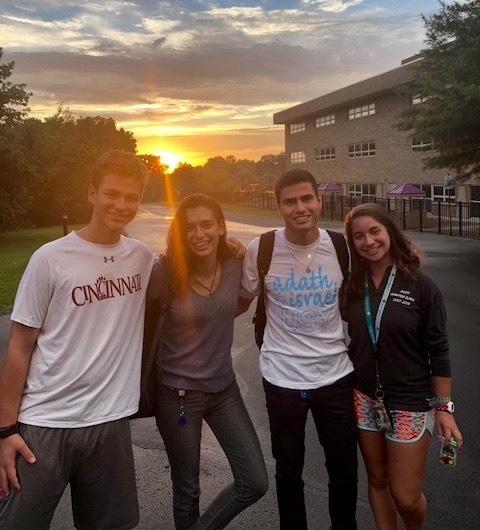 This is the 15th year of the Friends from Israel/Chaverim M’Israel program, which brings two post-high-school teenagers from our partnership city, Netanya, to Cincinnati to share their stories, and teach people across the Cincinnati area about Israeli life. This is a program of Partnership2Gether (P2G) of the Jewish Federation of Cincinnati. How do they walk from one place to another? That was one of my first thoughts after I arrived in Cincinnati. My plane landed, and I got into my host family’s (Joel and Lynn Kling’s) car—fairly normal. However, as we drove through the neighborhood to their house, I noticed that there are no sidewalks—strange. That wasn’t the only cultural difference I noticed in my first weeks here. I experienced a whole slew of differences in the way Americans celebrate the High Holidays—some of which were really impactful, others disconcerting. I sat next to men at the synagogue for the first time in my life. Sitting on the same level as the men, as opposed to in the balcony with other women—which would be typical in Israel—made the experience more meaningful. I felt closer, quite literally, to the service. Also, seeing people I care for (women, no less) participating in the service made it so much more beautiful. My host sister Shayna sang during the s’lichot (prayers for forgiveness) service, and—I don’t why—maybe because I missed hearing Hebrew, or just because her singing was stunning—probably both—I shed a tear. Yom Kippur felt foreign as well. We stayed with another family the night before so we would be able to walk to shul (synagogue). While we were walking to Adath Israel Congregation, it hit me: people are driving! Life goes on! Nothing is shut down! It is Yom Kippur, yet it is also just another day here in the US. The people that saw us probably didn’t understand why two strange teenagers were walking on the shoulder of the road (not on sidewalks, because again, there are no sidewalks). In Israel, everyone walks on Yom Kippur, and everything is shut down, and no, life does not just go on. I realized how lucky I am to live as someone in the majority, and I am beginning to learn how it is to live as a minority, to learn to appreciate all the hard work it takes to be Jewish in the US. It has been more than two months since we arrived, and in one sense, it feels like we have been here forever. We got to know everybody in the community, and Cincinnati feels like our second home. The little things that make it feel like home—killing that one annoying house fly, watching our favorite TV show (Manifest, or as we call it, “The Weird Show”), staying up until 1:00 a.m. talking about life with Shayna, or talking politics during dinner (just like home)—aren’t little at all.